Mobile plus Mobility. When Mercedes-Benz makes an appearance and embarks on a journey to an event, it keeps things coherent and consistent with jangled nerves. Taking what would otherwise be a classic automotive tradeshow to a different level, they reach out to new target groups and foster new relationships. As the host of a congress they showcase the new brand experience of Mercedes-Benz: approachable, personal, intriguing and inspirational. In 2017, Mercedes-Benz made its first appearance at the MWC in Barcelona. 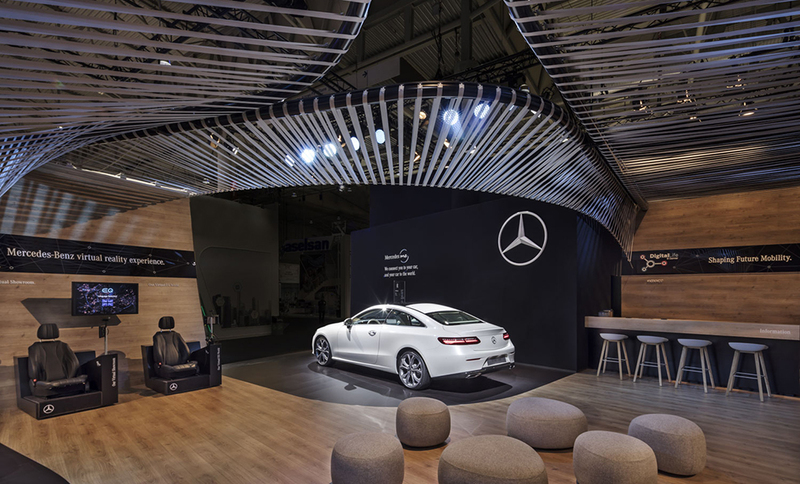 The design and communication mirrored its successful appearance at the Las Vegas consumer and technology tradeshow CES 2017, acting as a satellite by conveying the same strategy and concept of Mercedes-Benz. This laid another important brand milestone for the event, based on the same design created for Mercedes-Benz for all digital technology shows. So again, everything revolved around people and ideas – the content, the architecture, even the use of space and layouts.